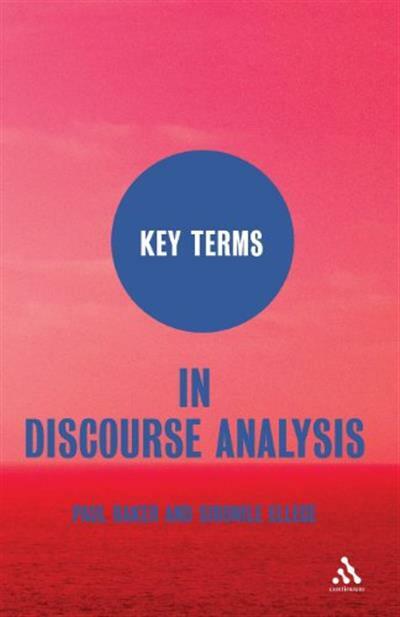 Paul Baker, "Key Terms in Discourse Analysis"
This title offers a clearly written and comprehensive set of definitions of key terms in discourse analysis, a core area of all linguistics and language studies courses. Unlike many other areas of linguistics, Discourse analysis is a complex field to define, comprising a number of related but different theoretical and methodological frameworks. Discourse can mean many different things to different people. Students often find these multiple meanings to be confusing and this book attempts to spell out and reconcile the different approaches, to give a holistic picture of Discourse Analysis as a branch of several disciplines. As well as comprising a glossary of key terms, the book provides clear, illustrative examples, a section on key thinkers and their ideas, and key texts for further reading. This book is essential reading for students on linguistics, language studies and media and cultural studies courses who are engaging in discourse analysis. "The Key Terms" series offers undergraduate students clear, concise and accessible introductions to core topics. Each book includes a comprehensive overview of the key terms, concepts, thinkers and texts in the area covered and ends with a guide to further resources.